The Soldiers’ Home National Cemetery started in 1861 in the aftermath of the First Battle of Bull. Eventually it filled up, and was replaced by Arlington National Cemetery. All told, there were roughly 8,000 burials during four years of the Civil War. Today, there are roughly 5,200 remaining Civil War burials; the other 2,800 have been reinterred throughout the country. Thanks to the work of an Ohio history class, we have a complete database of all the remaining Civil War burials in the cemetery. You can see the raw data of the burials in this Google Spreadsheet. We have arranged the burials by date of death, name, regiment, cemetery section, and grave number on different tabs. On this page, we’ll discuss how the numbers of burials changed over time, and how that reflected Lincoln’s time at the Soldiers’ Home. First, here is a chart depicting the total number of burials per year. Right away, what stands out is that 1862 had the most burials. In fact, with 2,562 burials that year, 1862 had a hair under 50% of the 5,200 Civil War burials. 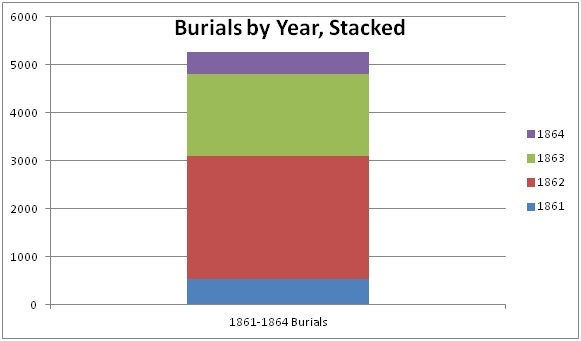 Below, here’s a stacked graph of the total burials by year; again 1862 dominates. Of course, burials did not occur just once throughout a year. They occurred several times a day, and certain months had more burials than others. The next chart graphs the burials by month over the four-year period in question. Here we see that 1862’s huge number of burials was not evenly spread out throughout the year. 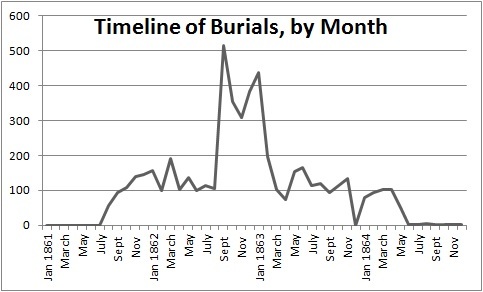 Instead, from September 1862 through January 1863, burials at the Soldiers’ Home cemetery dramatically peaked. In fact, those five months witnessed roughly 2,000 burials, about 38% of all burials over the 40-month period. Another way of seeing this five-month peak is via a chart of burials by months color coded by year. Here too, the big red bars at the end of 1862 plus the green of January 1863 stand out. Lastly, here’s a gallery of four charts depicting the burials by month, one for each year. As you can see, the sharpest increase was from August to September 1862. 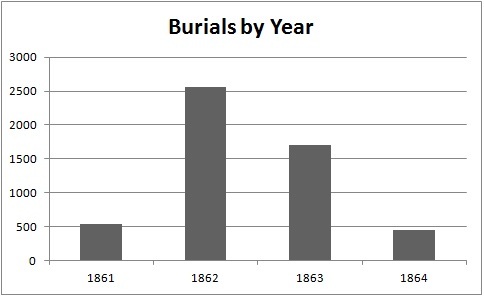 All these charts clearly indicate that the fall of 1862 saw the most burials. What explains this rise? Throughout the early summer, the bloody Peninsula Campaign and the Seven Days Battles claimed thousands of Union lives. Many of the wounded were transported via the Potomac River from the Virginia Peninsula to Washington, D.C., where many died in cramped and uncomfortable Washington hospitals. The journey for many was harrowing and at times even deadly. Then, from August 28 to August 30, 1862, the bloody Second Battle of Bull Run took place just across the Potomac River in Virginia, only 30 miles from the Soldiers’ Home. During the Battle, the Union suffered roughly 10,000 casualties. Looking at the chart of burials at the cemetery, over 50 people buried in the cemetery died during or immediately after the Battle of Second Bull Run. Just three weeks later, the bloodiest single day of the Civil War occurred 60 miles northwest of the Soldiers’ Home at Antietam. Yet again, a shade under 50 soldiers died the day of or immediately after the Battle of Antietam. Many Civil War soldiers died, however, days, weeks, or even months after being wounded, whether from illness or infection as a result of their wounds. Thus, many of the soldiers who died throughout the late fall and summer of 1862 did not die on the battlefield, but in hospitals, still very far away from their homes. Lastly, the increase in January of 1863 may reflect casualties from the Battle of Fredericksburg, another bloody battle fought the previous December: another 50-plus soldiers buried in the cemetery died December 11-15. Yet, Lincoln did not only witness the specter of death out his window; it also knocked on his front door. On August 23, 1862, a man named Colonel Scott visited Lincoln with a request. His wife, who had come to Virginia from New Hampshire to care for him when he was sick, had died in a horrible boat collision on the Potomac River. Many drowned, but Colonel Scott miraculously survived. Confederates buried his wife on the Virginia side of the river and Scott went to Lincoln requesting permission to go across the lines and retrieve his wife’s body for a permanent burial in New Hampshire. Lincoln, in a moment of stress and exhaustion, chastised Colonel Scott for coming to him and expecting preferential treatment. Colonel Scott left in disappointment. The next day, however, an apologetic Lincoln went to Colonel Scott’s hotel and granted him permission to head to the Virginia shore and collect his wife’s remains. Perhaps Lincoln, in a moment of reflection, thought of the graves in the cemetery beyond his home, and their loved ones back home, while deciding to make amends with Colonel Scott. Despite these constant reminders of the cost of war, Lincoln spent the summer and fall of 1862 at the Cottage deliberating, drafting and defending the Emancipation Proclamation. He first mentioned it to the cabinet on July 22, 1862, as burials in the cemetery started to increase. He released the Preliminary Proclamation on September 22, 1862, just five days after the Battle of Antietam, in the middle of the peak burials. And although he had moved back to the White House by then, on January 1, 1863, when he signed the official Emancipation Proclamation, another sharp increase in burials occurred. In fact, perhaps this last graph is the most illuminating. 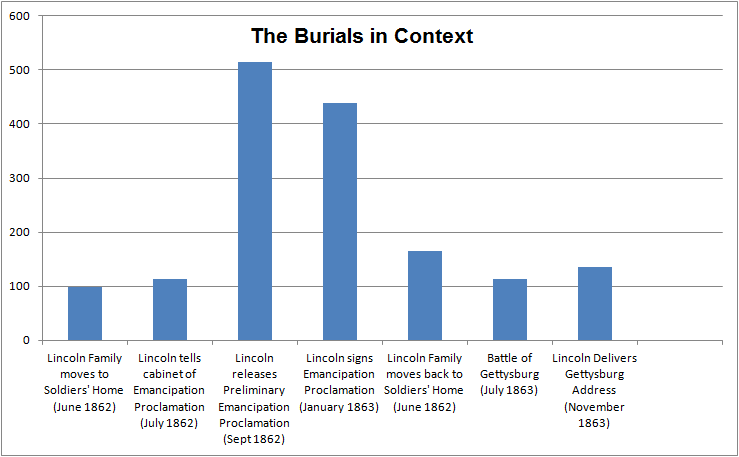 The x-axis lists key moments in Lincoln’s Presidency; the y-axis the total burials for the month during which the event took place.